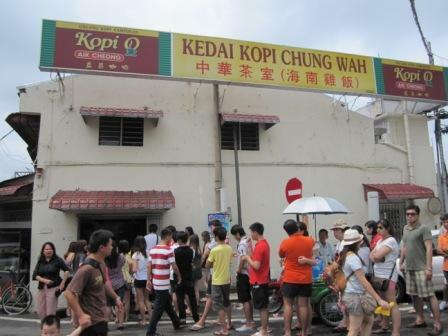 For lunch, we had at the Malacca famous chicken ball rice-or Kedai Kopi Chung Wah. It is located at the start of Jonkers Street if you come from the direction of the AFamosa. Don’t be too worried by the queue- it clears quite reasonably fast. If you go on weekdays, it is not so crowded. On Sunday, before the restaurant is opened already got people queuing outside. You just queue up and then when it comes your turn, just need to let the person know how many persons eating. Everyone would eat the same thing: white chicken with the rice balls. One plate: 5 rice balls. 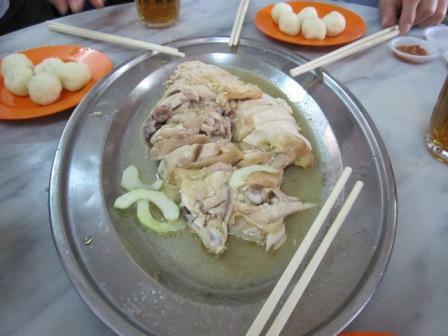 For 4 persons, it’s half a white chicken and cost about RM27. 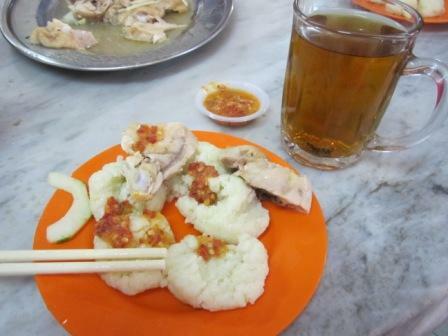 My friends said it’s delicious so if you are visiting Melaka, it would not be complete if you did not try the dish. Above: The rice balls. You can order Chinese tea to wash down the oil. There’s another one at Jonkers Street that is also appearently as famous- and you would not miss it because like the one above, you would see a lot of people queuing outside as well.